This request is to help youZingit promote our website to college students. Come up with original ideas to help us create engagement and awareness among college and university students. We had a similar contest on Facebook some time ago. One of the results of that contest suggested we try and attract more college students to youZingit. This request goes out to anyone (not just college students) that can find cost effective ways to encourage students to register and participate on youZingit. Reaching large numbers of students is the key! Certainly, social media and traditional advertising is obvious. youZingit is looking for out-of-the-box solutions. 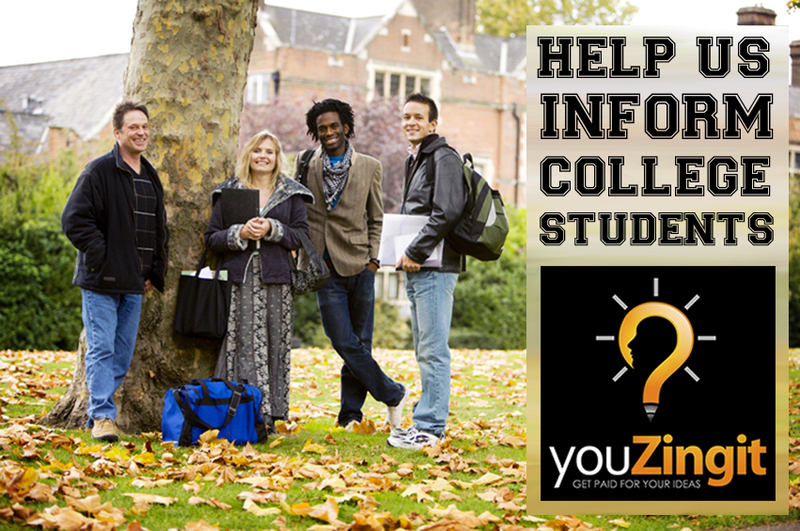 Assist youZingit in developing a marketing strategy to attract college students. You must submit a written marketing strategy (as described above). Original Photos or Videos are optional. The written submission must be in English. If a video is not in English, it must have subtitles. All of the submissions will be displayed publicly at the end of the RFI as long as all the cash awards are paid out. The number of college students you get to post the name of their college on your idea page. (share your idea page on your social networks and direct friends to leave comments on your youZingit idea page). All ideas are shown in a “short” abbreviated form. When the “full” idea is viewed, a view fee is paid even if the rights to the idea are not ultimately purchased. Only Premium Members will be paid the view fee. Find out more about a Premium membership here. Only one submission per User is permitted, although you may submit more than one photo or marketing idea in a submission.